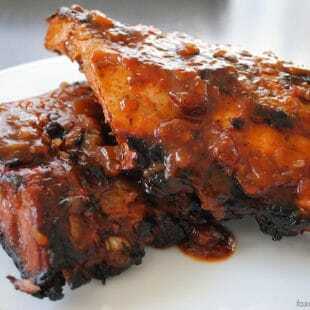 I adapted this recipe from the best rib recipe I’ve ever made – Dr. Pepper Ribs from Men’s Health. They are sweet and tangy, and fall-off-the-bone tender. I knew if Dr. Pepper would work, so would root beer. 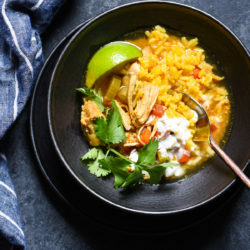 The cool thing about this recipe is that people can’t really tell you used root beer – it’s not a flavor you can pick out and identify in the finished product. All you know is that the ribs are amazing, and there’s a secret ingredient. I’ll leave you with the photo my husband thought looked like two racks of ribs making sweet, sweet, low & slow love. Yeah, he’s hilarious. Place ribs in large baking dish (I use my big roasting pan. I also generally cut each rack in half so I can get everything nestled in the pan easier). Pour all but 1 cup root beer over ribs. Sprinkle 2 tablespoons salt over ribs; cover and refrigerate at least 4 hours or up to overnight, turning once if possible. Preheat oven to 350 degrees F. Remove ribs from root beer and pat dry with paper towel. Discard root beer in pan; wipe pan dry. Place ribs back into pan. Add 1 cup water; cover tightly with foil. Cook 2 hours or until meat is nearly falling off the bone. Meanwhile, make Root Beer Barbecue Sauce: In small saucepan, heat oil over medium heat. Add garlic and onion; cook 3 to 4 minutes or until onion is soft, stirring frequently. Add remaining ingredients (including reserved 1 cup root beer and 1/2 teaspoon salt); heat to boiling. 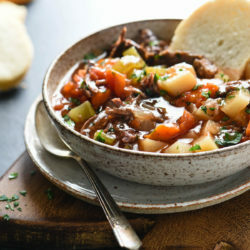 Reduce heat to medium-low and simmer 15 to 20 minutes or until sauce thickens, stirring occasionally. Just before ribs hit the 2 hour mark in the oven, preheat grill for indirect grilling over medium-high heat. Put bones on cooler side of grill, bone side down. 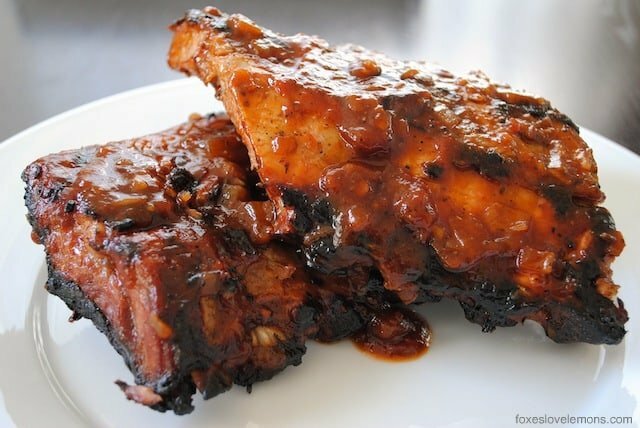 Brush with some Root Beer Barbecue Sauce and cook 10 to 15 minutes, then flip. Brush with sauce again and cook until ribs are lightly charred and meat is falling off bone. Serve with any remaining sauce. Bring wet-naps to the table. Great combo Lori. Root beer in dishes is so good. Its one of those flavors that makes people say, “Hmm what makes this taste so good? Your ribs look amazing!! They are calling to me!!! I haven’t had ribs in so long, now I must make them! Thanks Jennifer! I hope you enjoy them! Ribs are just SO good every once in awhile. Thanks Paula! I think beer would work just fine, for sure. Maybe add a touch of molasses to try to replicate some of the root beer flavor? I’m always looking for new bbq recipes. I’ve seen a few using Cherry Coke or Cherry Dr Pepper but never Root Beer. Looks good. Thanks Chris! Now I want to try Cherry Coke, too! These ribs look awesome! I don’t drink soda, so I never have it around nor think about using it in sauce but I bet it tastes really good and lends a flavor profile you just can’t put your finger on! What a great idea! My hubby would love, love, love these!!! I admit I was a little disappointed you discarded the root beer in step 2. Doesn’t “raw pork-infused root beer” just sound like a missed opportunity? I do love root beer and ribs, but always love experimenting with substitutions. I bet ginger-ale in place of the root beer would be good. 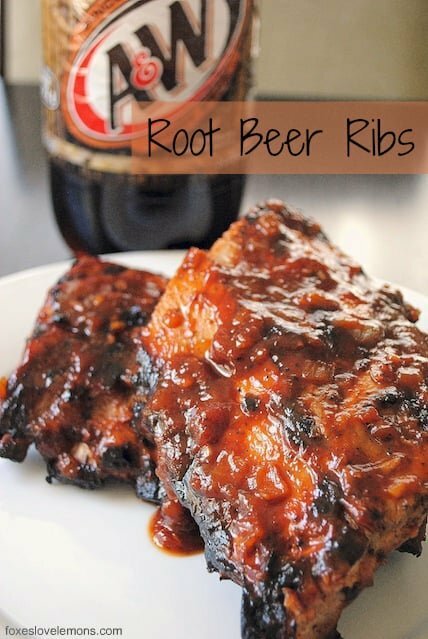 I’ve tried root beer ribs and Dr. Pepper ribs, and now I really want to try ginger ale ribs! I bet those would be really good, Russell! Maybe they could have an Asian flair to them? I am so glad to hear that, Deanne. I usually make this recipe myself each Memorial Day, but we were just too busy this year. I’m thinking maybe for the 4th of July! 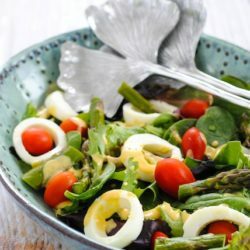 Tried this recipe and it tastes great I made some revisions (added a little and decreased some of the ingredients but nothing major) since we did not have an oven I used a turbo broiler. So glad to hear that, Archie!